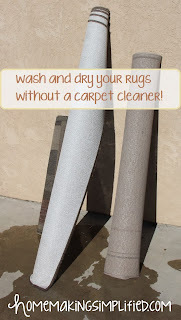 Homemaking Simplified: How to Easily Wash and Dry Your Rugs without a Carpet Cleaner! Carpeting is a great thing, but over time, rugs collect dust, debris, food, and other not-so-pretty things. This is especially true with kids in the house. Our kids are asthmatic, so the allergens that our rugs collect must be kept at bay. We have had a trusty carpet cleaner for the past six years, but after losing a filter cover we have had to find another way of keeping our rugs clean. So here is what you will need: dirty rug(s), laundry detergent, a water hose (spraying attachments are a plus), a cemented area, and a bristled brush (we use a long car-washing brush that looks like a push-broom). After vacuuming your rugs, take them outside to a cemented area. We use our driveway. Hose down your rug(s) until they are completely saturated with clean water. Next, you will pour some laundry detergent on your rug. Since detergents are usually pretty concentrated, just use a little and distribute it around the rug rather than in just one spot. Pay special attention to obvious stains and very dirty areas. Next, spray water over the soapy areas to create a few bubbles and then begin brushing your rug. Once you have brushed the entire rug, let it sit in the sun anywhere from 10 minutes up to 24 hours. The longer you let it sit, the more the detergent can work out stains. This is usually where we begin a little water play! After you are done letting the detergent work, hose down the rug starting on one end and working the detergent out of the rug. 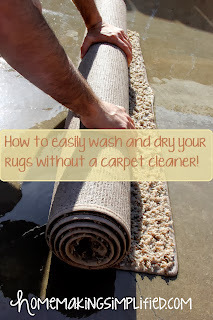 Once the water is running clean, roll the rug tightly to remove excess water. This will also ensure that the top part of the rug is not exposed to too much sunlight which risks bleaching. 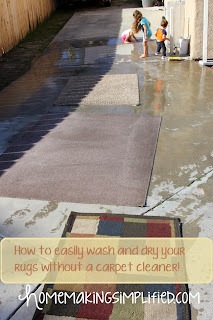 Finally, find a dry area where you can stand up your rugs to drain and dry. If your rugs are very expensive or have rubber backing, you may want to place your rugs in a shady area. I like to keep mine out in the sun. The average drying time for a small to medium sized rug is 48 hours in 70 degree heat with around 50% humidity. Once the rugs are partially dry and finished draining, they can be opened up to finish drying, but be sure not to over expose the carpeted side to the sun. And voila! You are done! Enjoy some time with water play! Look at these big smiles! Rug cleaning days are always a family favorite! DO NOT try this for the first time on expensive, heirloom, or otherwise precious rugs. Have these cleaned professionally or with an upright carpet cleaner that will assist in the drying process. DO NOT do this in the fall/winter when it is cold out or in a place with high humidity. Your rugs cannot dry under such conditions. DO NOT use bleach or harsh chemicals. DO open your rug once its partially dried so that it ALL dries thoroughly.